Defence roles include defending territorial seas, deterring intrusive or aggressive acts, conducting maritime surveillance, maintaining an armed naval presence, ensuring right of passage, protecting marine assets and contributing to a blockade if required. The Naval Service must also be capable of supporting Army operations by sea lift and close naval support. And as you said there is no mention that the role only includes FP or that it is limited to surface vessels. It's not just the NS that suffer from the same issue though, and sadly it's not going to change short of some major international incident. Interesting link which explains the importance of mine countermeasures in a modern environment. No-one doubts the importance of mine warfare what the article does miss is the need to be able to co-deploy MCMV alongside Amphibious vessels. The former have limted range and a speed between 12-16kts while the Amphibious vessels are long range at relatively high speed of 20kts. It was one of the reasons why the USN went for the LCS concept. Have the USN deployed an LCS outside home waters yet? They've done "showing the flag" work out of Singapore, though I think only one of the two classes has actually had any hulls do so, none with the Mine systems, honestly I wouldn't use the LCS as anything other than "more money than sense". Both hull types have now done a long tern deployment to Singapore. The main problem with the LCS is not the concept but the solution. The USN was to have picked one design which it would have then developed and built, instead because of politics (the bain of many a program) they ordered both. Two little time, too few resources to ensure that both designs were mature before entering service. Had they gone the original plan they would most likely have a relatively good vessel at the moment. As well as the structures being different the sensor suites are also different, this all raises the level of development risk. Already in the current batches of vessels there can be seen many upgrades being built into the vessels. And as for the follow-n FFG(X) program, my money would be on the Freedom class variant. And we must not forget that these are 44kts+ craft with a shallow draught of 4m but still with a 4000nm range. And when compared to the NSC of the Coast Guard the price is a snip $360m for the LCS and $735m for the NSC, different mission but similar weapons and sensor suite. Last edited by EUFighter; 13th August 2018 at 07:32.
be for high capability mines while the former might be field mines or barrier mines. The minelayers were often high speed like HMS Manxman capable of 30/40 knots. Mineclearance by sweeping , or swimmers aided by UUV's systems , is a slow persistent operation not requiring other than passage speed typically 14/16 knots, and that was restricted by weather. There is still a NATO standing Force dealing with some of the 200,000 mines etc deployed around the Baltic region. Amphibious warefare has an immediacy about it in that it takes place on an unannounced day and cannot be telegraphed by days of noticeable preparations. The solution is to choose cleaner sites selected by covert teams. HMS Manxman was retired in 1972, the USN retired their minelayers long before that and currently South Korea with the Nampol & Woosan classes, Poland with the Lubin class and Finland with the Hameemaa class are the only navies with dedicated minelayers. Until recently the German Navy did also have the capability to lay mine with their Gepard FAC which are now retired. For the Baltic Sea estimates vary from 40,000 to 200,000 mines, but this is tiny compared to the total amount of UXO in the same area. As I said before in the North Channel between NI and Scotland there was 2,000,000t of UOX. Some has already exploded but no-one knows how much remains. The favoured dumping spot was the NNW/SSE Beaufort Dyke in the North Channel where more than a million tonnes of ordnance has been dumped by the Uk with a supplemental amount by our Services. AFAIK this has now stopped however there has been up to at least 40 explosive issues ranging from 6 big Bangs , classed as Cat.1 to those classified down to Cat 0.1. There are amounts of old chemical ordnance there principally Phosgene shells, also old bombs and unfused DC's, including ours. Big Storms have caused some shore detonations off the RYNNS of Galloway. I suppose all Off together would yield a poor man's Megatonne. Gives a different meaning to SHELLS on the charts! The dumping area is clearly marked but as nothing every stays where we dump it then the remain could be spread over a vast area. Seems like the USN have a few issues not knowing what a real mine or training mine is! [QUOTE=EUFighter;462567]Seems like the USN have a few issues not knowing what a real mine or training mine is! Usually training mines are distinctively marked in high viz colours. Not sure about this one . It looks like a real one but 300/400 lbs of HE would create a much bigger water displacement . Own and wandering mines are always going to be a show stopper until dealt with. A discussion on possible replacements for the UK mine countermeasures fleet suggests hull replacements will not happen until sometime from 2026 to 2033, but that it seems clear that the future vessel will be steel hulled mother ships. The 13 Royal Navy mine countermeasures vessels (MCMV) that remain active are ageing ships but a series of ongoing incremental upgrades will ensure they are able to remain in service into the early 2030s. Here we examine some of the upgrades and a take an overview of the complex plans for the RNâ€™s future mine hunting capability (and attempt to navigate the confusing set of associated acronyms!). Mines are a cost-effective way an adversary can deny access to ports, anchorages, and offshore structures. Mines are an attractive asymmetric weapon, particularly for weaker naval powers, they can be laid relatively easily and the technology continues to develop. A few well-placed mines can have a potentially strategic impact, keeping a fleet in port, strangling commercial shipping or preventing an amphibious assault. A new generation of smart, autonomous mines will to complicate the hunterâ€™s job further. Neutralising mines is slow and painstaking work that requires practice, preparation and the best tools available. The RN is still a world leader in this specialism and is working hard to keep at the forefront of developments. At any one time, a significant part of the RNâ€™s mine warfare strength is devoted to the Persian Gulf, ready to counter the threat of Iranian-laid mines. Despite the undiminishing threat from mines and underwater improvised explosive devices (UWIEDs), financial pressures have seen the MCMV force halved since 2000. Just 6 of the original 13 Hunt class are left in service after HMS Quorn and Atherstone were prematurely decommissioned in 2017. Under the 2015 SDSR plans, another Hunt is scheduled to go before 2025, leaving a total of just 12 MCMV. The Single Role Mine hunters (SRMH) of the Sandown class are down to 7 left in service of the original 12 built for the RN. Despite the cuts to MCMVs, personnel numbers in the Mine Warfare and Diving branches are now actually rising slightly for the first time since WWII. The remaining Hunt class vessels which date from the 1980s have all recently completed a major upgrade package. Starting with HMS Chiddingfold in 2012, the main work consisted of fitting new gearboxes and propellers and an upgrade to the hydraulic bow thruster system. Two new Caterpillar C32 ACERT engines replaced the old Deltics and have already proven very much more reliable in service. Great care has been taken to minimise the magnetic and acoustic signature of the new commercial off-the-shelf engines, while the chilled water plants have been improved and mess decks refurbished. The Hunt class are also being fitted with an improved new degaussing system that neutralises their modest magnetic signature. The SRMH are also having propulsion upgrades. The first ship to undergo the Sandown Volvo Generator Programme (SVGP) was HMS Bangor in 2014. The two Perkins CV8 diesel-generators are being replaced with more efficient Volvo Penta D13s. A replacement for the NAUTIS MCM command-and-control system fitted to all the minehunters is under development. The new Ocean Reconnaissance Combat Architecture (ORCA) will be fitted between 2019-22. The glass reinforced plastic (GRP) hulls of the MCMVs have a life expectancy of about 60 years and require less maintenance than steel-hulled warships. With recent upgrades to propulsion and mine hunting equipment, there should be no problems operating these vessels well into the 2030s, provided they can survive continual rounds of funding cuts. At present, searching using ship-mounted sonar is the primary way mines are located. In 2015 Thales UK was awarded a Â£33.5M contract to deliver the Sonar 2093 Capability Sustainment Programme (CSP). This will increase sensitivity and definition of the sonar, using wideband pulse compression technology, improving its performance in detecting low signature mines. HMS Grimsby was the first of the SRMH to receive the ST2093 CSP and has been conducting trials this year, with the system formally accepted into service in August 2018. In May 2018 the first unmanned minesweeping system was accepted by the RN. The ATLAS Remote Combined Influence Minesweeping System (ARCIMS) uses towed Coil Auxiliary Boats (CABs) that simulate acoustic or magnetic signatures of ships in order to trigger mines or confirm none are present. By 2022 there should be an established Maritime Autonomous Systems (MAS) based route survey and mine sweep / destroy capability in UK waters. Route survey is gathering seabed data for shipping lanes in advance, making it easier to spot newly laid mines. This is especially important in areas where the seafloor is very uneven with lots of Non-Mine, mine-like Bottom Objects (NOMBO) where it is easier for a potential adversary to lay and disguise mines. Route surveys of the entrances to key ports and naval bases is an important and ongoing requirement. It is unclear if there will be funding for the Hunt class MCMVs to have major modifications to their quarterdeck so they can launch, recover and secure an 8-tonne USV and its payload, which would offer a world-wide capability. From 2020, it is expected the MCMVs will at least begin to be fitted with command facilities for controlling MAS, even if USVs cannot be embarked on board. The Maritime Autonomous Systems Trails and Training unit (MASTT) is a small Portsmouth-based team tasked with testing and developing autonomous MCM systems on behalf of the MHC Project Team. The work done by this unit is building RN experience with MAS and will help and define future technical solutions and costs. MASTT were involved in the trials of ARCIMS prior to its acceptance in May and will continue to test the system well into next year. They have previously conducted autonomous USV launch and recovery trials using the Remus 600 UUV and various ROVs and collect data on navigational accuracy, and mine detection probability. Trials are conducted from a variety of locations; Falmouth, Portland, or the ranges at the British Underwater Test and Evaluation Centre (BUTEC) in Scotland. MASTT personnel also embarked in HMS Enterprise during her deployment as the Command Ship for NATO Mine Countermeasures Group 2 in 2017 and developed procedures for launching, recovering and operating the REMUS 600 UUV. The Maritime Mine Countermeasures (MCMM) project is an ambitious collaborative effort with the French to use a variety of autonomous systems to dispose of mines. Based on boats built by ASV, it will be capable of operations up to 30 miles away from controllers in the Portable Operations Centre (POC). The system is complex and will potentially integrate the USVs, UUVs, a mothership, data centres, the POC and use satellite communications. Theoretically, a controller in the UK could conduct a minehunting operation in the Northern Gulf using MAS launched from the mothership 30 miles away from the minefield. A consortium led by Thales Underwater Systems and BAE Systems and including ECA (France) and ASV, Wood & Douglas and SAAB (UK) were awarded the contract in 2016. The MMCM system is in a demonstration and assessment phase until 2024, the French Navy and Royal Navy will each be provided for a system for two years of evaluation and testing. If successful, further contract awards would be made for the production phase, ready for initial operating capability around 2028. 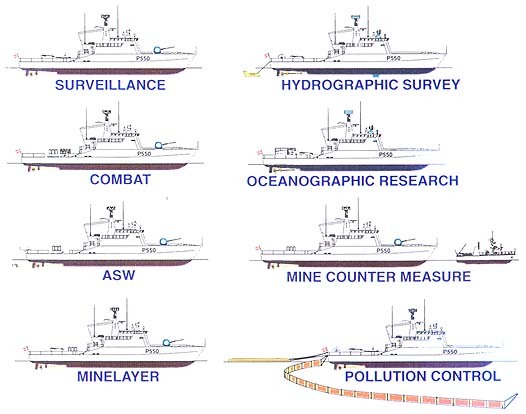 The Mine Countermeasures and Hydrographic Capability (MHC) project is a 10-year, multi-faceted assessment to decide exactly how the existing MCMV and Hydrographic survey ships will be replaced. In broad terms the expectation is that mine warfare in the 2030s will not be conducted by GRP-hulled specialist minehunters. The intention is to almost remove the human from the minefield entirely and use unmanned off-board systems (OBS). There will almost certainly be steel-hulled mine warfare â€˜mothershipsâ€™ to deploy this capability but procurement is some way off, expected between 2026 â€“ 2033. They could be cheap second-hand merchant conversions such as oil rig support ships. A sizable working deck for launching and recovery is the primary requirement above basic sea keeping and habitability. Alternatively, the RN could consider dual purpose platforms such as BMTâ€™s Venari-85 hybrid OPV/Minehunter. The Type 26 and Type 31e frigates will have a mission bay that can embark a mine hunting package of OBS, offering another potential platform for delivery. In some instances, there may be no need for a ship at all. The new way of minehunting can be done using MAS controlled from ashore using containerised command modules. The current planning for the MHC programme appears to offer a flexible, incremental procurement strategy. Dividing the project into stand-alone items reduces technological risk and the size of individual investment decisions. The various USV, UUV and UAVs, together with their control and transport systems should deliver a coherent set of capabilities to defeat all kinds of sea mines in different environments. Instead of buying a few expensive MCMVs, investment will be made in a lot of different small modules and capability packages. The technology is evolving fast and there is flexibility to bring forward or defer purchases, depending on the maturity and effectiveness of each solution. This seems is a sensible policy but there is a greater potential vulnerability to â€˜salami slicingâ€™ cuts than that already experienced by the much-reduced MCMV fleet. Deferring the purchase of a few unmanned boats is politically a lot easier than axing a minehunter. Let us hope the MHC programme, primarily in the shape of the MCMM project, is able to deliver the full suite of mine countermeasures systems and important elements are not lost along the way. Replacement of the two very successful Echo class Survey Vessel â€“ Hydrographic Oceanographic (SVHOs) are also part of the MHC project. Their successors may also follow the simple/cheap mothership concept but with a greater reliance on OBS such as oceanographic gliders, UAVs and other MAS. A suite of unmanned systems should ultimately be a cheaper and safer way to counter mines than current solutions. There should be a lower manpower requirement and no need for expensive and highly specialised MCMVs but it is important that the RN manages to procure the sufficient motherships needed to carry the MAS to wherever they are needed in the world. No matter how effective unmanned systems may become, there may still be occasions when the complexity of the underwater situation demands intervention from a diver. Delivering divers and their equipment to the scene will still be a consideration. The Hunt and Sandown class vessels have a wider utility beyond mine hunting for general patrol duties. In a very recent example, HMS Hurworth was employed to shadow Russian warships transiting the English Channel. Both HMS Echo and Enterprise have conducted lengthy deployments in the Mediterranean conducting maritime security and migrant patrols along with their core hydrographic work. These vessels also provide an important platform in the development of young officers, for whom an MCMV will probably be their first major sea going-command opportunity. There are also some personnel who tend to thrive in the close-knit MCM community in a way that they might not amongst the larger ships companies of major warships. Clearly, the phasing out of MCMVs and SVHOs will need careful consideration and the case for hybrid multi-role vessels perhaps makes a lot of sense. The original source link has some nice graphics also showing where MCM is going. On a slightly related note, the navy of Ukraine has been cleared by the danish government to purchase 3 Flyvefisken class Stanflex 300 type minehunters. The Ukraine will pay â‚¬102m for the three vessels. All three entered service with Denmark in 1990-1991 and decommissioned in 2010. I was always curious as to why they decommissioned those ships; it seemed to be a good concept. Think it was due to the changing nature of the tasking of the Danish navy along with budgets of course. Getting the dimensions of a particular ship right will impact it's seakeeping and seakindness characteristics. A multirole ship needs to be large enough to carry out all roles expected , plus have available a trained crew resource to meet required trades and skills to implement the roles. Navies changing ships and replacing them often means they consistently failed to meet requirements and were too square peggish in rounded holes ! These Flyvisken class vessels are suited to specific AOP's at 54m and 2.5 metre draft. They are multirole adaptable to most combat scenario's with advanced sensors in later production. Records show that the Lithuanian Navy acquired 4 of these vessels in 2008. 2009. 2010, and 2016 on transfer from the Danish Navy . They also acquired 3 RN Minehunters. AFAIK Ukraine have Soviet Bloc vessels. The Flyvefisken-class were not replaced by the Knud Rasmussan-class; the latter is a large OPV design to operate in the Danish EEZ off Greenland, something the Flyvefisken class was never tasked to do. They were drawn down following the re-organisation of the Danish Navy in 2004 & 2006, part of the general reduction in NATO navies at the time. Lack of money, manpower and a refocus of the operational policy were the main reasons. However the concept seems to have been a little ahead of its time, the Singapore LMV, the Saab MCMV80 and the Damen concept for the future Belgium-Dutch MCMV all draw upon a similar if improved concept. All use a modular containerised mission system to cover a number of differing missions, although at 80m I think they are on the large side for a CPV. Since the evolution of the modern OPV each batch or generation of vessel has tended to get bigger to cope with tasks demands. Ireland has it's open Atlantic requiring ships with greater environmental coping capabilities. The consequential increase in size and tonnage adds to additional cost and the need to give the ships a sensible level of self Defence, particularly when operating far from the home country.